Is traveling solo something you think about but aren’t really sure you can do it? These 20 tips for solo travel will help prepare you for your epic trip, whether it’s a weekend getaway or an overseas blowout. There is no need to let fear and anxiety stop you from hitting the road. Armed with common sense and expert knowledge (provided by yours truly) you will rock your solo vacation! You must have travel insurance, this is something that should be non-negotiable. Travel insurance isn’t expensive and not having it can be very expensive. What would happen if you were seriously injured or hurt, had to go to the hospital or worse? Isn’t it better to know you have an insurance plan that can support you in case of an emergency? Knowing how much you can spend before you fly out will help you tremendously. Planning your activities, costs and spending money needs will help you have a stress free trip. Plus, you will be able to do all the things you want to do and know how much money you will need in order to do them. Read my tips on how to budget for travel. Packing lightly will save you so much stress. Pack what you need in a carry-on bag (be sure to use packing cubes and follow my carry-on packing tips). You’ll have less to carry, keep up with and when you arrive at your destination, you can leave the airport without having to worry about waiting for your bag. It’s fun to post to social media but make sure you are doing it wisely especially when traveling alone. There is no need for you to let everyone on social media know exactly where you are every minute of the day. Check into places AFTER you’ve left. Post your pics from the day once you are back in your hotel or rental. Also, make sure your location is turned off when posting from your hotel so no one will know where you are staying. Whatsapp is one of the best ways to keep in touch with your family and friends while you are traveling. It’s free and you can talk, text, video chat, and send pics with ease. It’s available for iPhone and Android users. You can also use it from your desktop. This may sound like a contradiction to not letting everyone know where you are, but it isn’t. When you are traveling by yourself if something happened to you, how would your family know what to tell the police? They would have no idea what you are wearing to give a description. Making sure your family has an updated picture of you in case something happens is a smart safety tip. Likely nothing will happen but it is better to err on the side of caution, right? There is no reason to be scared when traveling by yourself at night, but it makes sense to take precautions. Get a ride home. I’m all for girl power and I do think women can do anything, but it just makes sense to be driven home when it’s late. Nothing says “I’m a tourist” more than walking around looking at your map. If you need to look at a map, go into a store, walk down an aisle and THEN open your map. There is no reason to let everyone know you are a tourist and that you don’t know where you are going. There is nothing wrong with a fancy purse, but walking around a foreign city dripping in the latest name brand may send off the wrong message. As a solo traveler, you never want to make yourself an obvious target. By announcing to locals you have money (which carrying a designer bag can say) isn’t the smart move. If you are traveling to a country where you don’t speak the local language, learn a few basic greetings. People really respond when you at least try to speak their language. Instead of staying in a hotel, consider renting a room in someone’s home. Staying in someone’s house may make you feel more comfortable about being in a foreign country, and they may be open to letting you spend time with them. When I traveled to Cuba, I was able to get a personalized tour of Havana from a friend of the people I stayed with. It was something I would never have gotten to experience had I stayed in a hotel. Many cities offer walking tours (sometimes free) which allow you to be around and meet other travelers. We took a walking tour in, Belleville, a lovely neighborhood in Paris and ended up getting along really well with our guide, Isabella. The next day, she met us and showed us some hidden gems in Paris that we’d never seen! 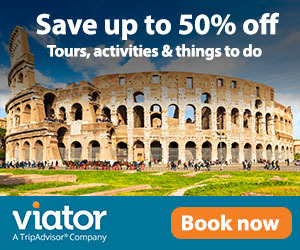 Save up to 40% off tours & activities in Paris and also check out how to Save up to 40% off tours and activities in London. Does the thought of sitting by yourself at dinner time make you uneasy? Consider dining out at lunchtime instead. You’ll get your local dining experience without being surrounded by couples on dates with love in their eyes. Also, by eating lunch, you save money as lunch (even a fancy one) is usually much cheaper than dinner. If you do decide to dine by yourself at night (I’ve done it numerous times, it’s not bad at all!) bring a book, a magazine or headphones to watch a downloaded program on your phone. This may help you feel more at ease if you have something to do while you wait for your food. The bar is perfect for dining! If you just aren’t up for eating at a table by yourself at night, go sit at the bar (if available, of course). This way, you don’t have to miss out on dining out at night and you don’t have to be uncomfortable. If you love to drink, that’s totally your business. However, please make sure to be smart about it when you travel alone. Don’t leave your glass or bottle unattended and do not get so drunk you don’t know what’s going on around you. Do NOT take public transportation if you are drunk and do not walk home. Get a taxi or a shared ride service. Walking around with earbuds in can make you miss out on many opportunities to connect with locals. It can also cut you off from what is going on around you and cause a safety issue. Stay in the moment and be present. You will experience more, interact with locals more and stay safer. Your phone can be your lifeline and you need to protect it. If it drops and breaks, what are you going to do? It’s nice to be disconnected from your phone on vacation but when traveling alone, it can be a necessity. Get yourself an Otterbox. I have one and have dropped my phone all over the world and it’s still working! Whether you are staying in a hotel or in a rental, verify you will be able to check in if you arrive late. You don’t want to arrive and then find out you have no way of checking in. Please don’t go for a walk or a jog around the neighborhood without some form of ID. This is not smart. What would happen if you got injured and couldn’t speak for yourself? I also recommend you have an, “In case of emergency, please contact…” card on you. Nothing fancy, just something with your emergency contact’s info on it. Also, carry a medical information sheet with you. Local medical staff will have the general yet necessary information about your health history in the case of an emergency or accident. Common sense is the working clothes of the educated. I heard that on NPR and it’s so true. If something doesn’t feel right, don’t do it. If it looks dangerous, stay away from it. You don’t (or shouldn’t) walk around in your daily life without being aware of your surroundings, so don’t do it on vacation. Do these 20 tips for solo travel sound like things you can do? Traveling by yourself can be an amazing experience, especially if you let common sense be your guide. Don’t wait around for someone to travel with you, you go this! Let me know where you want to go! I’d love to hear what your travel plans are Roni@ronithetravelguru.com. Of course, if the thought of planning your trip is overwhelming, I’m happy to take that stress away from you! You can focus on the tips for solo travel and I’ll do the planning!